Last year, the teachers I worked with were inspired by Jim Burke to create an "Expert Project" as part of our American Lit course. This is the abridged version of that project. August: We met and created the assignment sheet, still posted here. I had thoughts dancing in my head about "genius hour" and "20% projects." We envisioned a system whereby every Friday students would have the period to work on the research topics of their choice. September: We introduced the project and students spent several day identifying topics, writing appropriate research questions (not too broad and not to narrow), and starting blogs to document their process. By October we were deep into the "normal" curriculum, specifically The Crucible, which was a great unit, but we found that it got challenging to stop the momentum of the normal curriculum and give a day to the expert project. It was just too tempting to finish Act 3 or something else we were on a roll with. When we did give a day to the expert project, I would try to teach a research skill briefly, and then students would spend most of the rest of the period trying to use it, and/or remember what they had been working on when they last had an expert project day. It was frustrating. They were not making much progress, and when they did find something there was little time to blog about it before the period ended. Rethinking: At the semester break I paused to reconsider what we were doing with the expert project. I knew one day a week was not working. In one of those lightbulb moments it occurred to me that students needed to spend a week at a time on their expert projects in between our other units. That would still give them roughly the same number of days, but by lumping them together students could make more progress. My colleagues agreed and we adjusted our pacing to give a week to the project in between our remaining units. Now I could teach students a research skill on Monday, (say, how to use the Google News Archive,) and let them use it for several days. By Thursday and Friday they had found useful content and were blogging about their findings. There were benefits for teachers too. The end of any unit comes with a pretty heavy load of work to grade, and the beginning of a new unit is also an intense period of preparation of upcoming material. With an expert project week in between we could finish up our grading and get ready for the next unit with less pressure to do both at once. With a week at a time students became more enmeshed in their topics. They found details online and made connections with other experts. We learned about interview techniques. I asked them to pause and consider which perspectives they had not brought into their topic yet. They had to refine their search terms and try new angles. Then came the day Jose searched for his topic and found his own blog in the results. He was stunned. It sunk in that other people would find his work and possibly use it in their own research. I knew it was probably the filter bubble that had Google helping him find a blog he was already associated with, but his reaction to seeing his work in the results made me bite my tongue and encourage him to make his content even richer. Other students also began to notice more visitors to their blogs. It sank in that they had an audience, usually a niche audience who were very interested in the same subject. By the end of the year we realized that the traditional research paper originally described for this project was not going to work at all. We recast the paper into a feature article and did a short genre study of contemporary feature articles, using two from Wired magazine as mentor texts. Here is our feature article prompt and project requirements. Students struggled with integrating narrative and expository text, but they were invested in communicating about their topics. 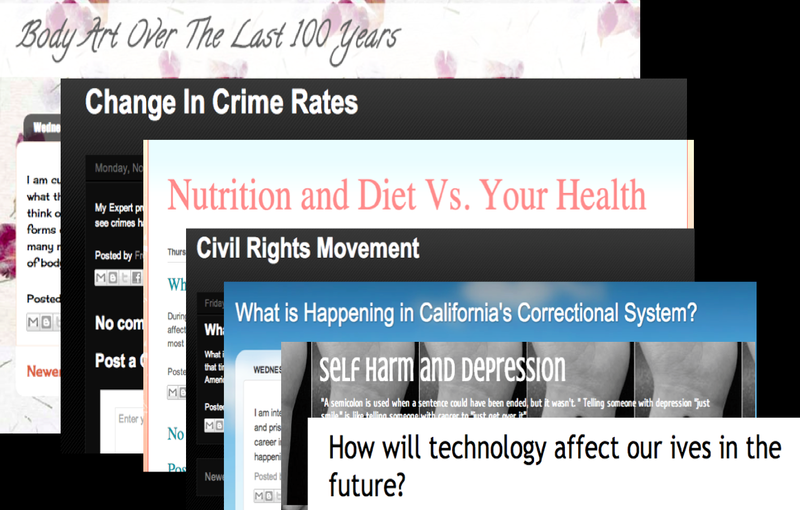 We worked on integrating graphics and text features like we found in magazines and online. Students pushed the limits of what could be done with formatting in Google Docs at the time. We published, presented, created and celebrated. One student, who joined our class mid year, created a pamphlet about self harm and cutting, an issue for far too many students. For some students the expert project was just another school assignment, they enjoyed it, but it didn't make a difference in their lives overall. For a few it made a huge difference, and in at least once case, it may have been a life saver. The common core exhorts us to make sure our students engage in short and long term research projects. Expert projects are a great way to do that, and putting the time in a week at a time between other units worked great with high school students. If you are planning for next year I hope this encourages you to give it a try.